Our efforts to transform education and strengthen society are evidenced by our accomplishments – made possible by our faculty’s intellectual leadership, our staff’s dedication and our collaborative partnerships around the world. We are rooted in history and tradition – sturdy, steady and stalwart. Every day, we are reaching new heights. While our focus remains clearly delineated within four priorities – Early Learning, Educational Technology, Student Success and Leadership – our story is layered and diverse, and our impact is boundless. Our U.S. News & World Report national rankings continue to improve as we remain No. 1 in the state of Florida and No. 1 among public universities in the Southeast. We continue as national leaders in online education (ranked No. 2 in the nation). Indeed, no college of education has made as much progress in the national rankings during the past eight years. Further evidence of our momentum is found in this year’s increase in research funding, up 26 percent to more than $128M. We are literally building a brighter future, as the rehabilitation to historic Norman Hall is now underway. The momentum at our college continues to grow as do our efforts to transform education and strengthen society. We are leading the way to a future where every child is prepared to enter school, giving children the opportunity to succeed through interdisciplinary collaboration. As part of a World Health Organization initiative, Brian Reichow, associate professor of special education, is often in the remote village of Kalomo in Zambia working to implement a skills training program for caregivers of children who have developmental delays or disabilities. The goal is to create a sustainable, scalable program for areas that do not have access to specialists. Closer to home, members of our Anita Zucker Center for Excellence in Early Childhood Studies collaborated with Gainesville organizations to build the CHILD Center, providing quality early learning care and education services to children from low-income families. We are integrating emerging technologies with proven learning techniques, using shared data, collaboration and learning analytics, to create the learning environments of the future. As the college continues to pursue the research and development of innovative teaching and learning techniques, our newest spaces will reflect this endeavor. Included in the rehabilitation of our historic Norman Hall, is the creation of the the Jamee and Gilbert Miller Ed Tech Learning Studio. This learning technology development space will house some of our greatest and most dynamic advancements for the education and learning environments of the future. Led by forward-thinking faculty and students, we are certain that these new spaces will inspire and support further innovation and continued growth. We are removing barriers and building bridges for improved outcomes in areas of literacy, special education, counseling and social justice for a brighter, more inclusive future. Rural students comprise a large percentage of students across the United States. Yet, rural education has been largely overlooked in the landscape on educational reforms. Funded by a US Department of Education grant and led by Fein Endowed Associate Professor of ESOL/Bilingual Education Maria Coady, Project STELLAR aims to provide support to English learners and their families by providing high-quality, job-embedded professional development for rural teachers and administrators. We are going beyond the classroom, to prepare our leaders to engage with and administer complex policy at all levels and to transform education through collaboration. 2018 marks the 50th anniversary of our Institute of Higher Education (IHE). Along with celebration, this milestone brought change in the retirement of long-time institute director Dale Campbell. Justin Ortagus, assistant professor of higher education administration and policy, has taken the lead as IHE director, promoting and facilitating excellence in graduate education and administration through collaborations that support the development and implementation of best policies, practices and research. 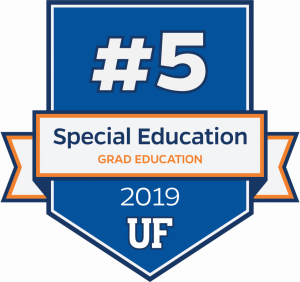 Our faculty, students and staff are working to close the research gap at the University of Florida main campus and around the world. We collaborate with every district in the state of Florida and in more than 30 states across the nation. Our impact is felt in Costa Rica, Haiti, Panama, Ireland, Switzerland, Italy, France, United Arab Emirates, China, South Korea, Uganda, Zambia, South Africa, Australia and beyond. We are working to transform education and strengthen society, at home and around the world. A collaboration among the Anita Zucker Center, the California Department of Education, Special Education Division and local partners, Embedded Instruction California (EI-CA) is closing the research-to-practice gap by helping teachers translate long-term learning goals for children with disabilities into smaller, actionable steps and embed these into classroom activities. Since 2015, EI-CA has enhanced the skills of 148 teachers and the learning trajectories of more than 300 children. EI-CA is projected to increase these numbers by 50 percent in 2018-19. 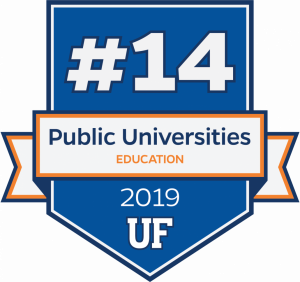 Literacy rates are declining across the country and faculty have identified the need to expand the impact of the University of Florida Literacy Initiative. Through a $3M gift from best-selling author, James Patterson, we have set the goal to double the number of Florida children who can read at grade-level. The James Patterson Literacy Challenge includes on the ground intensive reading professional development and online modules that complement and support innovative teaching practice. In a National Science Foundation-funded project, UF researchers led by associate professor Pavlo “Pasha” Antonenko examined whether it is best to use traditional, two-dimensional renderings of bonded atoms, or to adopt new multimedia technology that can render images of molecular structures in 3D for chemistry and related science curriculum. The research report received the Best Paper Award from the AERA Special Interest Group on Instructional Technology, finding that most students did not learn as well or as quickly using 3D models. A team of UF psychology and education researchers is pilot-testing training methods designed to advance the effectiveness of school resource officers in collaboratively mediating crime and violence. The $1M National Institute of Justice-funded project includes co-principal investigators from the Lastinger Center for Learning: Director Philip Poekert and Walter Leite, program evaluator-in-residence and associate professor of research and evaluation methods. The long-awaited rehabilitation to historic Norman Hall is now fully underway. This $29M project includes infrastructure repairs and upgrades, technology expansions and improvements, configurable classrooms and meeting spaces, increased research space, a café and conference center. This monumental undertaking will make Norman Hall more suitable for preparing the educators and leaders who will address the educational opportunities and challenges of the future. The entire EduGator community eagerly awaits the day when the look and feel of historic Norman Hall is as outwardly inviting as it is behind its well-worn exterior.